Birmingham earned their first win in six matches as defender Kyle Bartley scored twice before being sent off for his celebrations at Huddersfield. Serbia striker Nikola Zigic gave the Blues the lead from close range before Anthony Gerrard levelled for Huddersfield. Bartley, on loan from Swansea, headed Birmingham back into the lead after the interval after Jesse Lingard's corner. He made it 3-1 after a free kick before being red carded for over-celebrating. Bartley had already been booked for a foul and his dismissal left the visitors down to 10 men for the final nine minutes. But Birmingham dug deep to claim victory, boss Lee Clark's first win over Huddersfield since he was sacked by the club in February 2012. The visitors took the lead early on but were pegged back when Gerrard scored on his return to the Town side after a training ground bust-up. Gerrard, cousin of Liverpool midfielder Steven, missed the previous two games following his involvement in an incident with Adam Clayton and Martin Paterson. He made up by flicking home a header from Adam Hammill's free kick after 31 minutes to level the scores at 1-1. Hammill started despite being fined and told by manager Mark Robins to "grow up" for his reaction to being substituted in last week's defeat at Wigan. Both teams came into this match with only two wins in their last 10 matches - with the hosts having lost three of their last four outings. Birmingham made the brighter start thanks to ex-Huddersfield striker Lee Novak, who played in a wide role for the visitors. He forced home keeper Alex Smithies into a good save early on. Lingard won a 50-50 in the centre circle and Nikola Zigic put Novak through. Novak then helped put Birmingham in front with a shot from a tight angle on 11 minutes which keeper Alex Smithies did well to parry. Zigic, who stands at 6ft 7ins, showed good athleticism to slide in at the far post and hook the rebound over the line from close range. Novak, who joined on a free transfer in the summer, was a thorn in the side of his old club. Smithies saved well when he fired in from 20 yards on 37 minutes and then saw a Novak header from a Mitch Hancox cross drift wide five minutes later. The Terriers came more into it as the game went on. Sean Scannell twice went close while Ward headed over a Hammill free-kick after 23 minutes. The sides traded blows early in the second half, with Novak again forcing Smithies to parry at one end and Hammill drilling just wide at the other. Bartley's purple patch and red card followed, with Birmingham happy to see out the game after that. "It was more than poor, it was abject. Our performance has dropped way below what we expect and we should be picking up points against sides in the bottom three. "For whatever reason the players decided not to perform. "We gifted them two goals. We have run out of ideas and all the work we have done on the training ground has been left on the training ground. "It was just a bad day at the office." "Football is an emotional game. "Kyle hasn't enticed the Huddersfield fans. He has gone to celebrate with his own fans and common-sense should prevail. "Probably under the rules the referee had no option but you have to be allowed to celebrate. That's what the fans want to see." Match ends, Huddersfield Town 1, Birmingham City 3. Second Half ends, Huddersfield Town 1, Birmingham City 3. Oscar Gobern (Huddersfield Town) wins a free kick in the attacking half. Foul by Peter Løvenkrands (Birmingham City). Substitution, Birmingham City. Peter Løvenkrands replaces Nikola Zigic. Delay in match Nikola Zigic (Birmingham City) because of an injury. Attempt missed. Andrew Shinnie (Birmingham City) left footed shot from the left side of the box is close, but misses to the left. Assisted by Nikola Zigic with a through ball. Attempt missed. Joel Lynch (Huddersfield Town) left footed shot from outside the box misses to the right. Assisted by Anthony Gerrard. Attempt blocked. Anthony Gerrard (Huddersfield Town) header from the centre of the box is blocked. Assisted by Adam Hammill with a cross. Keith Southern (Huddersfield Town) wins a free kick in the defensive half. Attempt missed. Daniel Ward (Huddersfield Town) right footed shot from the centre of the box is too high. Substitution, Birmingham City. Dan Burn replaces Jesse Lingard. 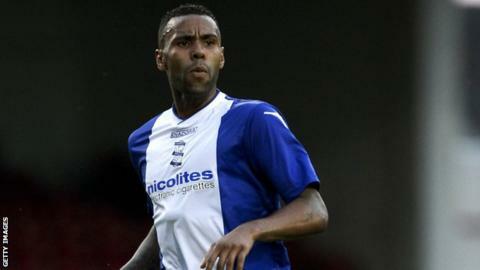 Second yellow card to Kyle Bartley (Birmingham City) for excessive celebration. Goal! Huddersfield Town 1, Birmingham City 3. Kyle Bartley (Birmingham City) header from the centre of the box to the bottom right corner. Assisted by Jesse Lingard with a cross following a set piece situation. Foul by Paul Dixon (Huddersfield Town). Attempt missed. Daniel Ward (Huddersfield Town) right footed shot from the centre of the box misses to the left. Assisted by Adam Hammill. Ashley Richards (Huddersfield Town) wins a free kick in the defensive half. Foul by Lee Novak (Birmingham City). Hand ball by Daniel Carr (Huddersfield Town). Attempt missed. Adam Hammill (Huddersfield Town) left footed shot from outside the box misses to the left. Assisted by Keith Southern. Mitch Hancox (Birmingham City) is shown the yellow card. Delay in match Mitch Hancox (Birmingham City) because of an injury. Foul by Jesse Lingard (Birmingham City). Goal! Huddersfield Town 1, Birmingham City 2. Kyle Bartley (Birmingham City) header from the centre of the box to the bottom left corner. Assisted by Jesse Lingard with a cross following a corner. Attempt blocked. Lee Novak (Birmingham City) right footed shot from outside the box is blocked. Substitution, Huddersfield Town. Oscar Gobern replaces Oliver Norwood.